Techirghiol, a town unique in the world, benefits from exquisite natural conditions. The climate, the sapropelic mud and the lake’s saline water make this spa resort, known since 1899, a famous destination, with a healing and fascinating environment. Lake Techirghiol, Romania’s largest saline lake, with a length of 7,500 m, a maximum depth of 9 m and salinity over 90 g/l, is known for the qualities of its saline (mineral) water and its sapropelic mud, used for the treatment of several diseases. The invertebrate fauna that populates Lake Techirghiol is dominated by the Artemia salina crustacean, which together with the Cladophora crystalina alga provides the basic material for the production of sapropelic mud with active mineral components, which account for its special therapeutic value. The Techirghiol Balneotherapy Center, the place where over half a million Romanians found a cure, is specialized in treating over 40 diseases. Over the time, the institution was visited by simple people, but also actors, high-performance athletes and other important persons. The resort has five spa facilities, one balneotherapy center for adults and one for children with motor deficit (on a permanent basis), a sanatorium for children with rheumatic disorders and rickets, and an open-air treatment facility for aero-heliotherapy, mud-pack therapy with cold mud extracted from the lake, followed by baths in the lake. The treatment consists of warm baths in tub or in basin with saline water pumped from the lake, packs with warm sapropelic mud, inhalation therapy, electrotherapy and hydrotherapy. The Saint Mary Monastery was built ar ound 1750 by the elder of Maiorești village – Mures county, of ancient holm trees. The monastery has impressive columns and arcades built in Brâncovenesc style. The edifice is built on a base plate made of Techirghiol stone, creating a pleasant contrast between the solid stone pedestal and the fragile wood church. The bronze statue of Saint Pantelimon, created by Ion Jalea, is a symbol of the miraculous healings (Saint Pantelimon was a doctor famous for his gift of treating diseases considered incurable). 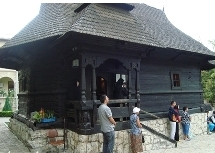 The monastery is also a famous pilgrimage place for Romanian Orthodox Christians, who come here to find comfort for various sufferings of body or soul. Located at 15 km distance from Constanța, the biggest city on the Black Sea coast, and only 3 km away from the Black Sea shore, the resort lays in the Dobrogea steppe region. Thus, Techirghiol enjoys a steppe continental climate, with marine influences, characterized by an average annual temperature of ca. 11 degrees Celsius, ca. 80% air humidity, almost permanent wind, with a speed of 4-5 m/s (especially between 11 am and 5 pm), average ionization of 900 positive and negative ions/cubic centimeters, with a slightly positive predominance. The average annual temperature is 11.2°C, and the rainfall is less than 400 mm per year. The sea breeze is less felt than on the sea shore, but the lake breeze is fully present. © 2011 Primaria Techirghiol · Stiri · Designed by INDRA SISTEMAS S.A. · Powered by INDRA SISTEMAS S.A.